This little stitch was created in my mind a couple of week ago, and had to wait it's turn to be posted. To date, it is my very favorite! I seem to be saying "It's a simple little stitch!" quite often lately...but it's true! 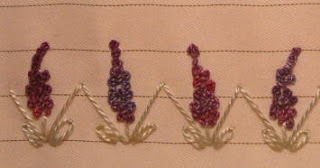 An unexpected pleasure of this stitch is that when done upside down it reminds you of wisteria or grapes, and right side up of hyacinths...or, at least, to me it does. The stem and leaves are medium green perle 8 cotton, and the french knots are a variegated purple/blue perle 8 cotton. Stitch the zigzag, stem, and leaves. Then build the stack of french knots starting at the bottom in layers. 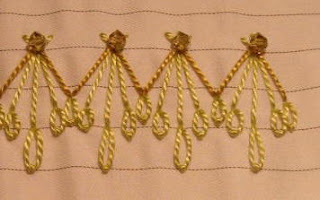 The flowers are identical until you get about half-way up, then the position of the knots change. This positioning causes them to appear to have some real life, and I like that very much. I'm finally glad to share this little beauty, as I've been "holding off" stitching it on any of my projects until you could see it. And, as I am numbering these on my computer as I go, I didn't want to get out of sequence! This little flower is a result of my wondering about how Stitch #10 might look if the stems were longer so the flower was fuller and not at tall. 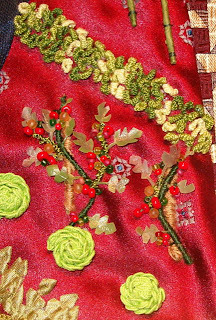 The entire flower is stitched in Perle cotton (sz 5); rose for the petals (lazy daisy stitches) and top (French knots); and olive green leaves (lazy daisy), French knot, and zigzag base. 2. 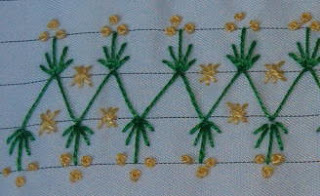 Stitch the green vertical stems and French knot. 3. Stitch the petal lazy daisy stitches. 4. Stitch the petal French knots. This is a simple little flower to do. 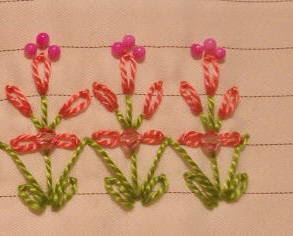 An option would be to fill in the center stem area with a star or flower shaped bead. Bead spacers (metallic) might also be a good option for dressing up this little wild flower. Here’s another simple flower. 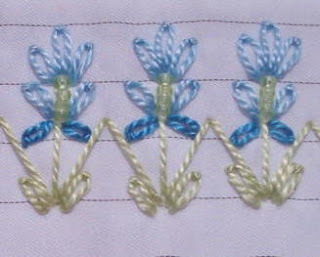 I like the darker shade of blue for the bottom “petals” which are slightly shorter than the upper petals…but wish that I had stitched the French knots in the darker blue rather than the stem color. 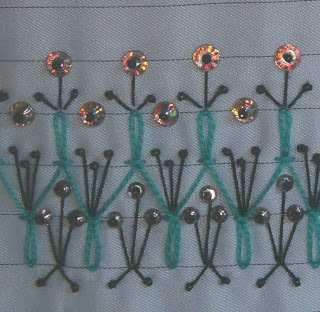 The entire flower is stitched in Perle cotton (sz 5); royal blue and sky blue for the petals (lazy daisy stitches) and olive green for the stem (straight stitch) top (French knots) leaves (lazy daisy) and zigzag base. 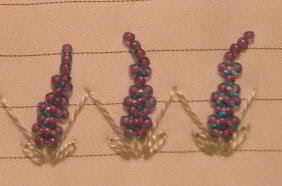 Of course, anytime you have French knots, they can be substituted with seed beads; just as in the last photo. 2. 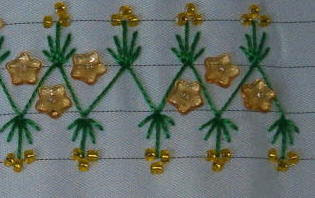 Stitch the green vertical stem, then the outside lazy daisy leaves, then the French knots. 3. Stitch the darker base petal lazy daisy stitches, pointing them slightly down. 4. Stitch the upper petal lazy daisy stitches starting with the very top vertical stitch then work the outside top stitches and then fill in with the lower top stitches. 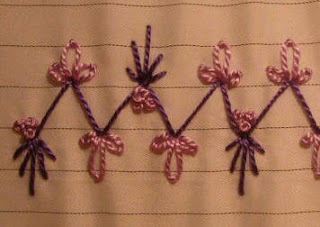 Fit them into the “space” of the stitch, and don’t go outside the zigzag width so each “flower” has room. This is a simple seam treatment, but has possibilities for change. If you built it a little taller by adding a couple more French knots and one more row of loops, it might resemble hyacinths in bloom. When I posted my portion of the Round Robin, which I titled Grandpa's Garden, I wanted to include a photo of a tree with cow charm. But, my camera took a perfectly horrible photo that was so out of focus, I barely recognized it had a tree in it. Of course, the block was already on it's way before I realized this error. My cyber sister was to my rescue and send me a better photo once the block was received. So, belatedly, I thought I'd share it. This flower is short enough to use on smaller projects or small patch pieces. 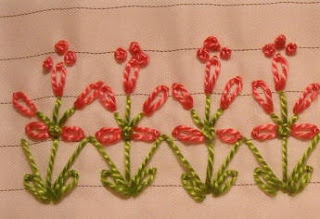 It would be cute worked along a seam without the zigzag…just evenly space the flowers, or connect with a simple long straight stitch. Olive green Perle cotton (sz 5) was used to stitch the zigzag, flower stem, and flower leaves…but the stem would be pretty done in brown as well. Chili pepper red Perle cotton (sz 5) was used to stitch the flower bud. The bud is a collection of French knots, grouped to form a round shape, with five straight stitches radiating from the top. 2. 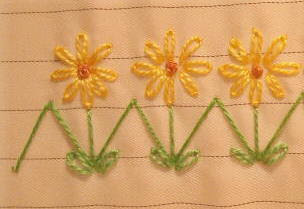 Stitch the straight stitch vertical stem first…then the outside lazy daisy leaves which are at 45 degree to the base. 3. 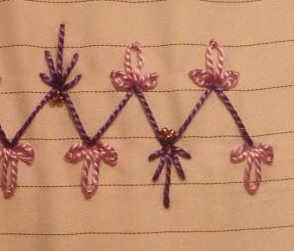 Stitch the French knots starting with the center row of 3…place these centered slightly above the stem. 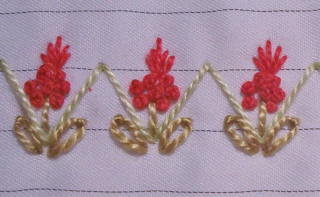 Then stitch the 2 french knots below this line of 3…and the 2 french knots above this line of 3. This will form a circular shape cluster of French knots. 4. 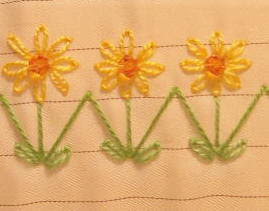 Stitch the straight stitches above the top row of lazy daises. 5. 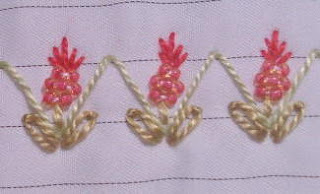 Red seed beads provide an alternate for French knots, as shown in the beaded photo. 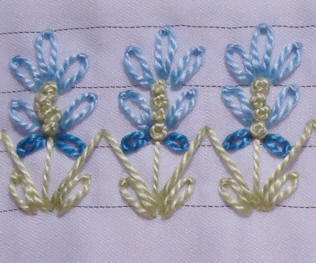 An alternate stitch would be to do the flowers without the straight stitches at the top as well. It has been pretty cold these last few days, and I'm ready for Spring to be here! The grass is all brown now, and there are no flowers. So, when this little daisy popped into my head...it was surely a welcome thought! And, opened a flood gate of floral ideas!! So, we will be walking through the gardens of my mind for the next few stitches. 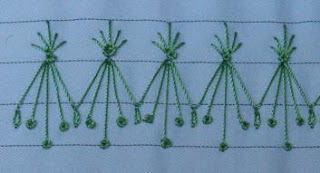 The assembly of this stitch is very simple...and can be easily followed along with just the chart I think. The colors chosen were very traditional yellow and green (perle cotton #5)...with a yellow crystal for the beaded center variety...but I thought white with brown or black in the center would be good. Of course, would not have photographed very well on the white fabric I'm working from...so the yellow it is! Hope ya’ll are enjoying the stitching. 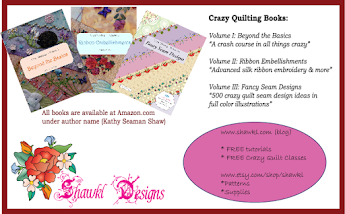 I’m having a wonderful time just letting the ideas flow…not that lazy daisy, French knot, and straight stitch really call for a lot of “brain power”. But, still…it’s fun! This is a pretty quick stitch…not overly complicated…and I like the change-up between the daisies and the straight stitch…just make sure you mark it off so you leave the same amount of “spaces” for the daisies each time. 2. Stitch the Straight Stitches. For this, I stitch the vertical stitch first…then the outside stitches because they are at 45 degree to the base…and then stitch the second and fifth straight stitches…since they are half way between the vertical and 45 degree ones. Hope this makes sense to you. 4. Stitch the Lazy daisies starting with the center one...which is a little larger than the two outside ones. I used Perle (cotton) size 8, in light and dark purple to stitch the sample; and added purple Rocialles on the beaded version. 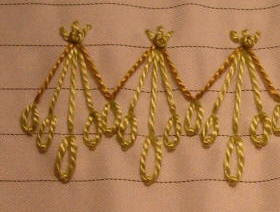 Here’s another stitch that is a good candidate for variegated threads. The sample is done in perle (cotton) size 8, beige and medium purple. 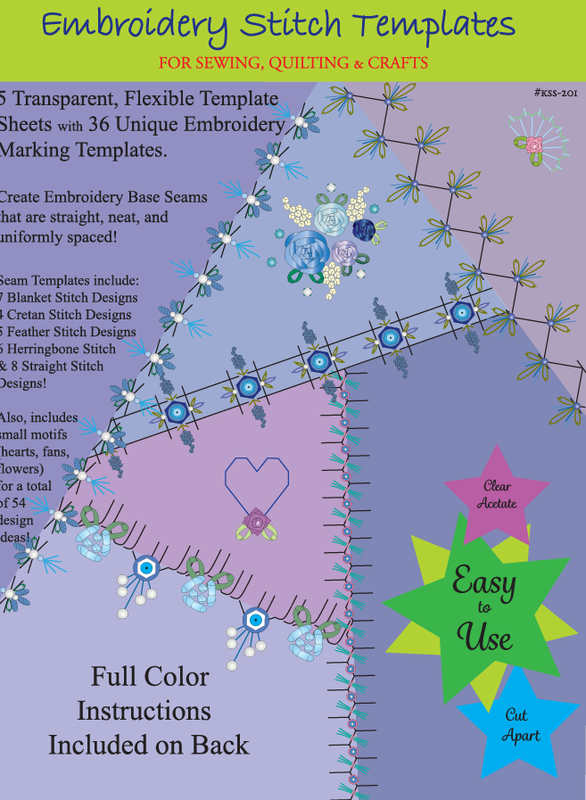 The beaded version replaces the French knots with Swarovski® Crystals (bicone, 2mm, color: jet AB). I've been working on a block effort for a cyber friend...a tribute to her late Grandfather. From her accounts, he was a very devout country gentleman. Every year he planted a large garden...so I attempted to stitch a small garden spot on the block. The base fabrics in the constructed block are from her grandfather's ties. It is an honor to contribute to a block for my friend. Two other ladies have already gone before me, and others will follow me, so the final block will be a surprise to me as well as my friend. 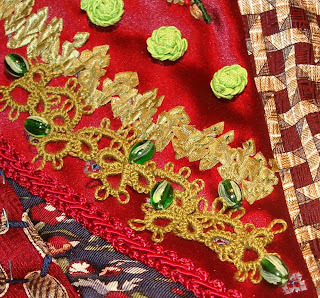 My contribution will be the garden, and some seam embellishments. Here are some photos of the garden's corn, lettuce, "tommy toe" tomatoes, cabbage, carrot tops, and watermelon. Hopefully, I have done the memory of his garden justice. 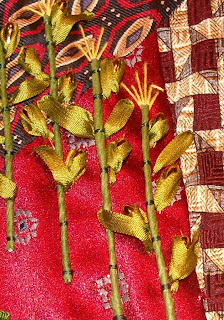 The corn stalks are covered floral wire with gold rice beads for the ears...covered in 4mm silk ribbon...and more SR for the leaves. 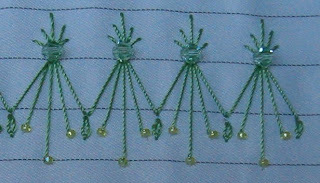 The lettuce is a cast-on stitch done in variegated green (perle cotton, sz12). The tomatoes have floral wire covered in brown fiber threads, with tiny little plastic branches covered in green threads...with various clusters of gold, green, red beads to (hopefully) resemble small tomatoes. The cabbage was cool to do...they are lime green rick rack roses. The carrot tops are silk leaves with clipped edges...and the watermelon vine is a peace of tatting from a dear friend. 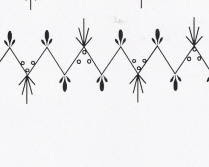 Here's a beauty...a simple little stitch that seems so delicate to me, and I will be using this one a lot I think! Stitched here in a single color, but could be done beautifully in variegated or two colors I think. I wish that I had not used the black thread on this stitch, as I think it makes it a little harsh. 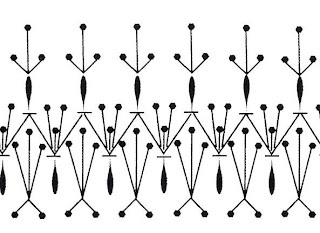 If you stitch it upside down, it might remind you of an Aboriginal drawing...as it did me. A light and medium blue would have been better...but, oh well...number 4 is done! Guess we need a few complex stitches along the way. They serve a purpose...filling up space!! :) I'll be eager to see what you do with this one! Stitch #2 is done in size 8 perle (cotton) in light purple, coral, and very light green. The beads are 2mm size mother of pearl (dyed very light purple). Now that I’ve got the photos large enough for you to see the details, I think I’ll have to work on the actual stitch chart. Perhaps cropping some of it out, and “shortening” the stitch row will make the actual stitches look bigger…of course, that means you don’t see the “ends” of the row, and that might be kinda weird. Well, let's give that a try...hmmmm, yep I like the larger version. 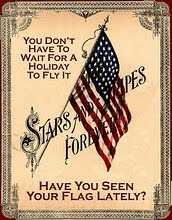 I'll try to get all the "bugs" worked out of loading pictures on this blog...long before we get to Stitch number 144!!! 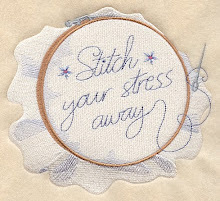 I’d love to see your stitches, so post to the HGTV message board when you finish. It will be interesting to see what colors you choose…and if you use any beads in your versions! Woo Hoo! Happy New Year! 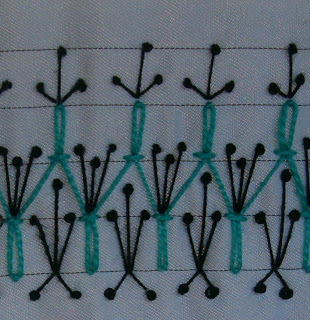 I promised the second and third stitches in the Twelve Stitches in Twelve Months Challenge, and just finished a blog for that…but when I added the photos…I had put a repeat photo of stitch number one into the files for stitch number three. Now, how did that happen?? So, had to stop…go back to my photos and re-crop and size the correct photo. In doing that, I realized that the images might be too small for you to get a clear idea of exactly how to stitch them…so I am going to do two blog entries, allowing me to put extra photos of each stitch. The stitch charts are done in Illustrator software, which I am new to using…so please do not get caught up with the “solid” versus “not solid” symbols I use. The stitch chart has black dots where the needle goes for the zigzag (I think I’ll try and do without that for the stitches I’m designing now…ssshhh, I’m on #16 if anyone is keeping up). If in doubt, look at the photos..and hopefully you can understand what the chart symbols represent that way. Stitch #2 is done in size 8 perle (cotton) thread. I chose Kelly green and bright yellow, and really like the cheerful combination. The right side has beads added. The tiny ones are rocialles seed beads (size 15/0) in Ceylon light yellow, and the larger beads are seed beads (size 8/0) in yellow with silver lining, the flowers are Czech pressed beads (size 7mm) flower bead caps in yellow.